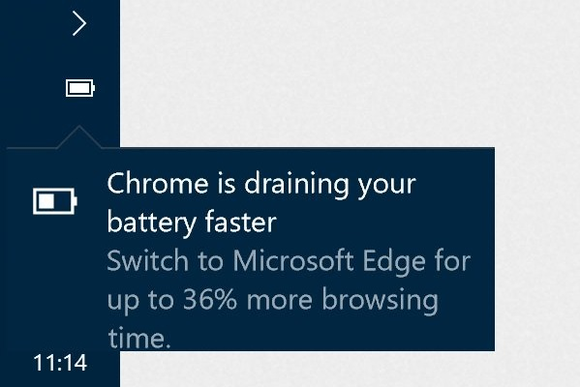 Microsoft tries to convince Chrome users on Windows 10 to switch to the Edge browser by showing them a popup stating Edge is better. The campaign seems to be another attempt from Microsoft to aggressively promote its own products. Previously the company was found to aggressively market Windows 10 to Windows 7 and Windows 8.1 users. The spokesman stresses that users can easily set any default browser and search engine they want. The information in the popup comes from a test Microsoft published last month. The conclusion of that test is that Edge would be the most power efficient browser. A claim that Opera challenged, however both Opera and Microsoft agree that Chrome is the most power hungry browser.